The meeting tonight was the last one of our Toastmaster year, which runs from 1 July to 30 June. First, we were all warmly greeted at the door by our hospitality person, Chi, who is a new member and did a great job of welcoming guests and members and handing out name badges to everyone. The meeting was opened by our acting Sergeant at Arms, Adam, who then handed over to our President, Paul A. Paul announced that there would be special biscuits tonight to celebrate the end of the Toastmaster year! Our Toastmaster for the evening was the very capable and former President, Richard Green. He introduced his team to us comprised of Timekeeper – what’s his name Paul Goodhill; Ah Counter – Christine; Grammarian – Fran; Warm up – Richard M and Hot Tip – Royston. Fran gave us a great word of the day, which was Panache, meaning style. Richard M led the Warm up by asking members to share three positive characteristics about themselves. Needless to say, several people said that they had panache, thus nailing the word of the day straight away. Royston gave a useful Hot Tip, which was to breathe from your diaphragm when you’re speaking, rather than from your chest, as it makes your voice more powerful. Our first speech was by John Cross with a speech about the poems of Percy Bysshe Shelley. This is usually abbreviated to Shelley, which isn’t surprising! John gave an entertaining speech about three of Shelley’s most well-known poems, which are, “One Word is Too Often Profaned” about love; “The Masque of Anarchy” about the Peterloo massacre and “Ode to a Skylark”. Our second speech was by Alex Clark, who gave an illustrated talk about how to use Internet dating sites. He gave some great advice on what to avoid when searching through the profiles of prospective partners, including, fleeces, trout mouths and lime-green clothes. Useful advice indeed for anyone thinking of using one of these sites. Speech three was a demonstration talk by Annelise about how to make Crepes. Annelise had recorded the procedure at home and gave us a Powerpoint show on how to make them. She also brought in the fruit of her labour, which we were able to devour in the break. The speeches were then ably evaluated by Dave H, Simon and Riya. During the break we tried Annelise’s crepes and plenty of chocolate ginger, double Belgian choc and Raisin biscuits to celebrate the end of year. Annelise, you’re a great cook! After the break Adam led the Table Topics. He chose books as his theme, especially Harry Potter books and asked some interesting questions about characters from the books. The Topics were all ably evaluated by Georgina, who gave the speakers some useful feedback. The General Evaluator was Jenny A, who made some useful comments about how we run the meetings and made some suggestions for improvement. She reminded us of the Club Mission, which is to provide an encouraging environment to our members so that they can develop their speaking and leadership skills and grow in confidence. Jenny said that we had achieved our mission this evening – which is good to know! She stressed the value of the hospitality role and recommended that those doing this role should be given top priority for a table topic as an incentive for doing it. Then onto the Awards. 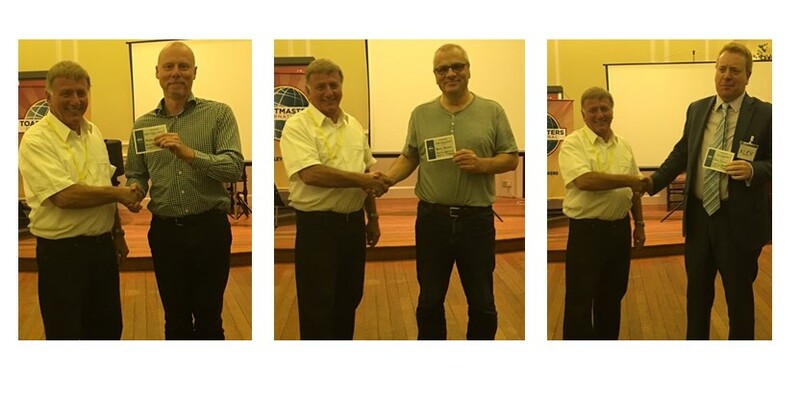 Alistair won the Table Topics award with a speech about “Lord of the Rings”; Dave H won the Best Evaluation Award for his evaluation of John’s speech and Alex won the Best Speaker Award for his speech about Internet dating. Paul then presented some ribbons. First of all to new members, then for giving the Ice Breaker speech, Half- Way to completing CC and for completing the CC Manual. Finally he presented a ribbon to John Cross for being the Most Improved speaker this year. It was also noted that Alex has made considerable progress over the last month. Paul then presented everyone from the committee with a “Thank You” note for their work during the past year, which has helped to make our club stronger, more vibrant and a club of excellence. He especially thanked Jenny T and Richard M for mentoring him this year and Jenny A for her help. A big thank you to all those who took on roles and gave speeches and helped to make the evening a great success. Overall it was a meeting with great panache! Our next meeting will be held at the Bickley Manor Hotel on 6 July where we will be having a sumptuous meal, an entertaining after dinner speaker and the official handover to the new committee. Watch out for an email from Jenny T with more details. All tickets for the event have been sold so, if you missed out, book now for next year to ensure getting a seat! Our meeting on 27 July is an extra meeting to be held at the Shortlands Tavern. Please ensure that you go there rather than our usual venue.